The remnant of CK Vulpeculae, previously known as the oldest recorded nova. 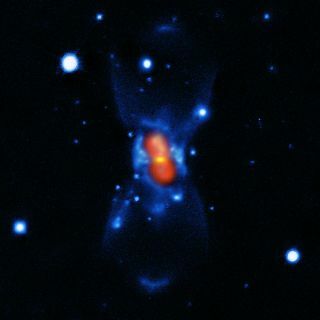 Shown here, CK Vulpeculae is surrounded by a dusty torus (yellow), cool molecular gas (red) and hot atomic gas (blue). This image was taken using APEX & SMA (dust and molecular emission at submillimeter wavelengths, Kamiński et al. 2015) and Gemini (optical atomic emission, Hajduk et al. 2007). Cosmic detectives are investigating a case of mistaken stellar identity: An exploding star that was once thought to be the oldest recorded nova — a nuclear explosion on the surface of a dead star — was more likely caused by the merger of two stars. In 1670, a bright new star appeared in the constellation Cygnus, the Swan, and stayed there for two years — you can see the location of the new stars in this video. The short-lived star was grouped into the "nova" category, but over the last 30 years, astronomers have been questioning its identity. A chart showing the position of a "nova" that appeared in 1670 and was dubbed Nova Vul 1670. It would later be renamed CK Vulpeculae. Its location was recorded by the famous astronomer Hevelius and was published by the Royal Society in England in its journal Philosophical Transactions. In 1670, a new star appeared just above the head of the swan that makes up the constellation Cygnus. Many astronomers took note of this newcomer, so its appearance and life span are well documented. It was dubbed Nova Vul 1670 —at the time, "nova" referred simply to any new star. In the last 300 years, however, the word "nova" has taken on a much more specific and scientific meaning. Many things about CK Vulpeculae's identity as a nova just don't line up, said Tomasz Kaminski, a postdoctoral fellow at the European Southern Observatory. For example, novas tend to burn in the sky for days — not years, as CK Vulpeculae did. Plus, the new star of 1670 didn't disappear right away. After two years, it faded, then reappeared, then faded for good — which is very unusual for a nova, Kaminski said. And observations have shown that CK Vulpeculae's temperature is much lower than that of a nova, where the radiation from the nuclear reaction continues to generate heat after the explosion is done, Kaminski said. The new study, which is detailed in the March 23 edition of the journal Nature, may finally strip CK Vulpeculae of its "nova" title. Kaminski and his co-authors looked at the different molecules present in the wreckage of CK Vulpeculae, and found a profile that they say cannot be created by a classical nova. But if CK Vulpeculae isn't a nova, then what is it? This wide-field view shows the sky around the location of the historical exploding star Nova Vul 1670. The remains of the nova are only very faintly visible at the center of this picture. In the new paper, Kaminski and his colleagues argue that CK Vulpeculae is a phenomenon with multiple names in scientific literature. They've been called red novas, red transients, luminous red transients and intermediate luminous optical transients (ILOTs), among others. "People who study these red nova realized all the observations we have of these objects can be explained only if they explode as [an] effect of a collision and a merger of two stars," Kaminski said. The notion that a red nova could be a unique category of stellar explosion took hold in 2008, when astronomers watched two stars in a system orbit in toward each other and produce an explosion with the characteristics of a red nova, Kaminski said. "Many of the novae we know from historical records could be this type; it's just that people observe them during the outburst, and then no one really cared what happened with them," Kaminski said. "And that's why they didn't realize maybe we're dealing with some new phenomenon." "This is a major step," he said. The chemical profile shows the presence of molecules and isotopes that are strange compared to other types of stellar explosions, including classical novas, Kaminski said. In fact, the profile is actually somewhat unique among red nova, which may be a product of CK Vulpeculae's age — perhaps something happens in these red novas over time that produces a unique bouquet of chemicals, he said. Kaminski cautioned that scientists are still working to demonstrate that red novas are, in fact, the products of stellar mergers. Noam Soker, an astrophysicist at the Technion Israel Institute of Technology, was one of the scientists who previously suggested that CK Vulpeculae was a red nova. He and some of his colleagues have theorized that red novas are not the result of sudden stellar mergers, but rather are produced by the gradual accretion of matter from one star to another. He and Kaminski said one thing that would help clarify the cause of a red nova would be observations inside the clouds of debris, to see the stars that remain there. Kaminski said that, right now, the available evidence suggests that CK Vulpeculae is a red nova. But it's possible that in 10 years, someone will come up with a different explanation for how this stellar explosion came to be. "This is science and astronomy: You propose something new, and everyone is welcome to find supporting evidence, or disprove it with some new theory or new observations," he said.